Here we are, a week out from Chicago and I am finally sitting down to write my recap. To make a long story short, I didn’t achieve my goal. 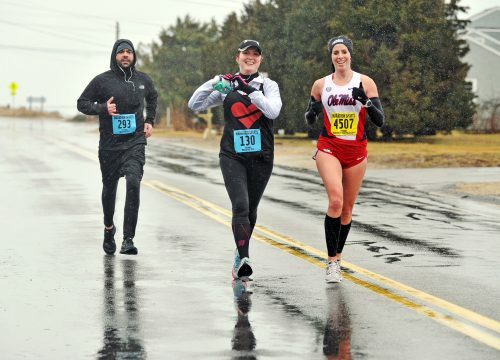 After running 3:32 in less than ideal conditions in Hyannis, I felt ready to break 3:30 and that’s what I had trained for this whole cycle, but unfortunately I didn’t get it done on race day. But I’ll get to that. 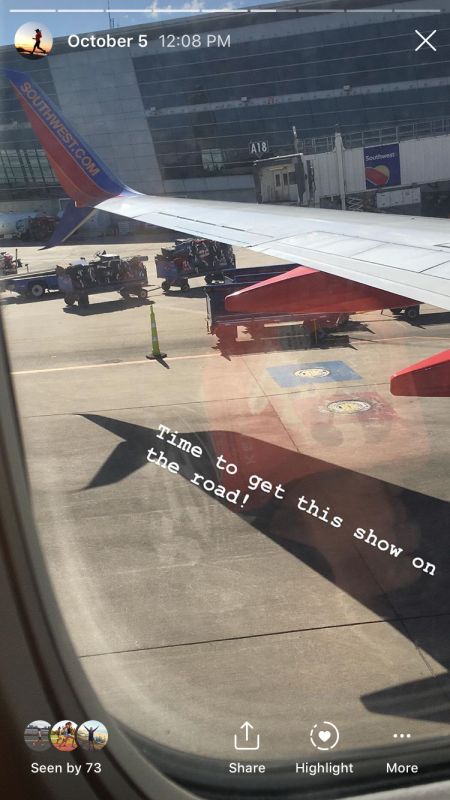 I flew out Friday afternoon and thankfully had no issues with my flight. I landed in Chicago around 3 and quickly Ubered to my hotel downtown (I stayed at the Congress Plaza hotel directly across from Grant Park and highly recommend it). I dropped my bags quick as I could and walked a couple blocks up the street to the Hilton where I was able to catch a free shuttle to the expo. There were multiple shuttle pick-up points throughout downtown, which I thought was an awesome touch on the organizers’ part. After picking up my bib without incident, I wandered the expo, picking up some great swag and bumping into a few friends who were also running. With Chicago being my first World Major (and big city marathon), I was really excited to get some good gear at this one and the expo did not disappoint. I got a late dinner with friends that evening and then crashed pretty hard back at the hotel. Saturday came bright and early with some pretty intense thunderstorms. Thankfully, they seemed to have passed by the time I went out for my 20 minute shakeout run, but it did make me nervous about the weather for Sunday and whether the start would end up being delayed if there were storms. After my shakeout, I met up with the other Oiselle Volee members who were in town at a nearby Panera. 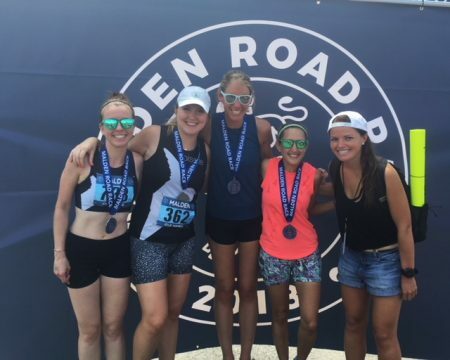 I ended up sitting across from Allie Kieffer there, and LOVED getting to chat with her a bit about marathon training and her build to NYC (Allie is a professional runner who came in 5th at New York last year). 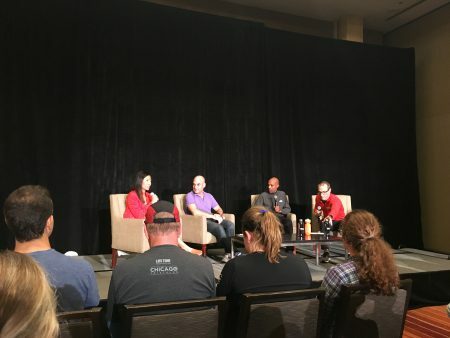 In the afternoon, I went to a live podcast recording hosted by Bibrave, featuring Peter Sagal and Meb kKeflezighi. This ended up being SO entertaining (love Peter Sagal!) and the perfect activity to keep me off my feet and relaxing. 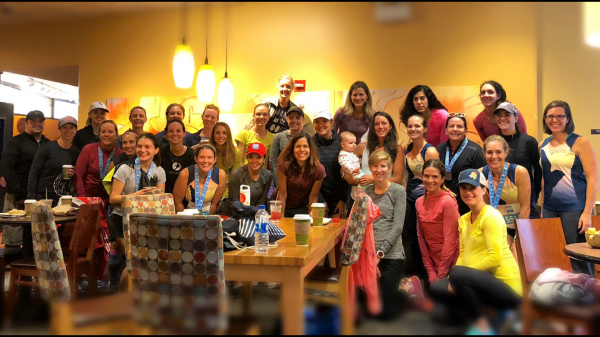 The Oiselle group who attended the podcast recording! After that, I just headed back to my hotel to relax and get ready for the big day. I watched some Netflix, laid my things out and generally did a good job keeping things very low-key. 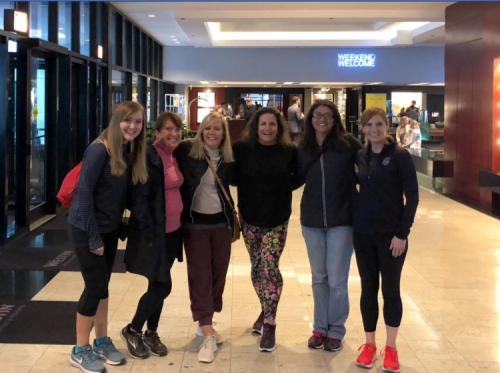 Going into the marathon, I knew I was going to be tempted to do ALL of the meet-ups and special events that were going on with the race, so I wanted to make a concerted effort to relax and do everything I could to ensure a good race day. Mission accomplished on that front at least. That night, I read and tried to go to sleep around 9:45 or so. Unfortunately, as soon as I laid down, I started thinking about the race and getting excited. Despite using every trick in the book to try to fall asleep, my body wasn’t having it. I knew my sleep had been pretty good leading up to the race so I wasn’t overly stressed about it, but it was more annoying than anything else. All told, I think I got about 3 hours of sleep MAX that night. It was definitely the worst I’ve ever slept before a race, so maybe it did affect me but it’s hard to say. FINALLY, my alarm was going off and it was time to get up. I got ready in my room, alternating between drinking coffee and Maurten. I had my bagel and peanut butter which I had brought with me and I was ready to go. Team Paws was doing a bag check/breakfast for team members right in the hotel I was staying in, so I popped down and dropped my bag off. This was much nicer than trying to deal with the craziness of the race bag check. I used the indoor bathrooms a couple times and wanted to use it ONE last time before heading out to the corrals, but the lines suddenly became INSANELY long in the hotel. The wave 1 runners for Team Paws were on their way out, so I headed out with them thinking I could just do a quick porta-potty stop before jumping in my corral (this was about 6:30 am, the race started at 7:30). I should have known this would be cutting it too close for another bathroom stop. The lines for the porta-potties were INSANE. And even though there were a lot of them, the line barely moved. At 7:15, I heard someone say behind me that they closed the corrals at 7:20, so I immediately jumped out of line and headed to my corral (E – the last one in the first wave). At this point, the crowds were PACKED. We were all standing on top of each other and people were jostling for position, but it was impossible to move very far. I tried to relax and stay calm, but mostly I was freaking out about the fact that I hadn’t been able to use the bathroom. I debated whether to stop for a porta-potty on course, but I knew that would probably add at least 1 minute (probably 2) to my time and I didn’t want to risk that and possibly miss my goal. I figured I’d give it a few miles to see if the feeling went away. The first few miles ticked by quickly. 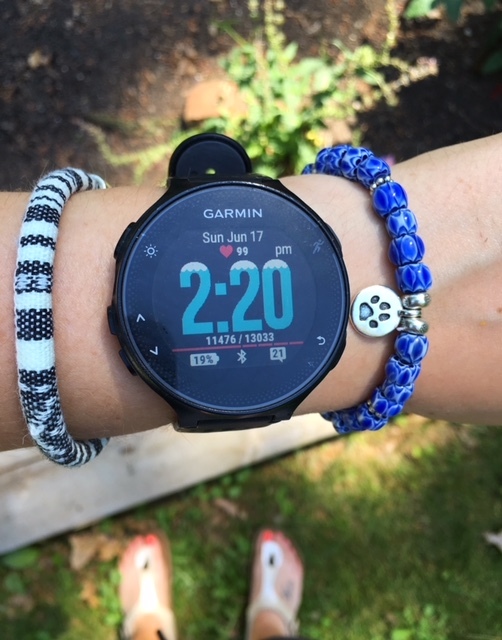 My coach had advised me to use the manual lap function on my GPS watch since the tall buildings and bridges completely throw GPS watches out of whack in Chicago. I was supposed to be around 8:10 – 8:15 for the first 10k. I clicked off the first mile in 8:06, followed by 8:26 and then 8:09. I felt great. I was so excited that after MONTHS and MONTHS of hard work and anticipation, I was finally running the freaking Chicago Marathon. The spectators were amazing. Even though it was cool (low 60s) with spitting rain showers, the crowds were out and they were cheering. I tried to settle in, knowing the plan was to pick up the pace a bit after the first 10k. According to the Chicago tracking app, I averaged 8:10/mile for the first 10k. On the fast side of what my coach had prescribed, but still within reason. Miles 7 through 11, I was aiming for 8 – 8:05ish pace. I ran 7:52, 8:02, 8:02, 8:04, and 7:58. Pretty good. 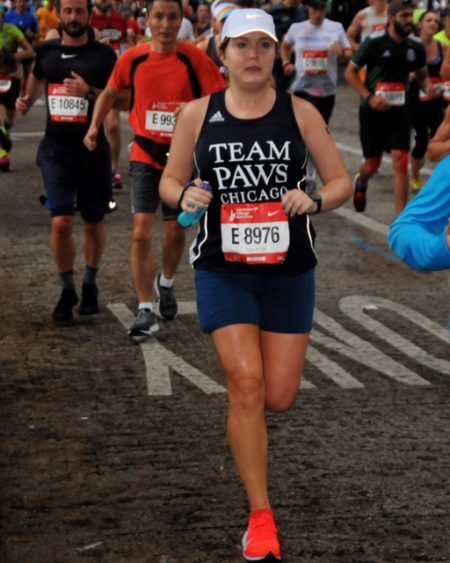 I was running relaxed and soaking in all the cheers I was getting for Team Paws along the course. I particularly loved the woman who was standing with her two dogs, who yelled out to me “We love Team Paws! 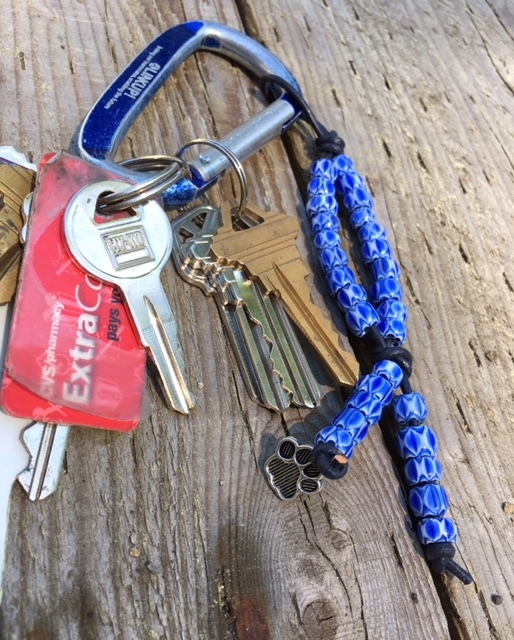 They gave me these two!” I focused on sucking down my gels every 3-4 miles. I think around this point, I may have started using a mantra I had heard from Amy Cragg that I really liked – “I breathe in strength, I breathe out weakness.” I was still feeling good, I was more just trying to focus on my breath. After mile 11, it was time to start getting more serious. The goal was 7:50-7:55 pace for the next 4 miles. I ran 7:58, 7:54, 7:51, 7:56 and 7:53. I checked my overall time as I came through the halfway point and I was at 1:45:56. A little behind where I wanted to be, and I definitely felt a little rush of nerves. On top of that, I could feel some light fatigue in my quads. I knew it was WAY too early to be feeling the miles, and that was my first inkling that maybe it wasn’t going to be my day. It was after mile 16 that things began to fall apart more rapidly. I was supposed to be running 7:45ish pace, but I hit a 7:57 and then 8:06 for mile 18 and it was pretty much at that point that I realized sub 3:30 was not going to happen. I was using my mantras and trying to stay strong, but I just knew I didn’t have any more 7:45ish miles in my legs and I didn’t want to blow up with 8 more miles to go. To my credit, I didn’t freak out. I decided to ease up and to try to have fun and enjoy the crowds and the experience as much as I could to the finish. I was NOT going to let myself walk, but I would run slower. Mile 19 was 8:09, followed by 8:49, 8:48, 8:49, 9:01, 8:50, 8:49 and 9:01 for mile 26. I wish I had been able to kick a little more at the end, but I was having this awful high chest cramp that wouldn’t go away. After crossing the finish line, the emotions started to wash over me. 3:37 is a great marathon time and definitely not something to be ashamed of, but I just felt so sad to miss my PR and the BQ. On top of that, my legs were in HORRIBLE pain and the damn finishing chute was so long and they kept yelling at us to keep moving forward. All I wanted to do was sit down but there was nowhere to sit and I was getting cold and my bag was back with the Team Paws bags at the hotel. In the hours after finishing, I really thought that this might be my last marathon. I couldn’t get over how much my legs hurt (and how much the last 8 miles hurt). To devote so many months to training and to miss my goal just sucked. Now that I’ve had a little time to reflect, I know I’m not done with the marathon. I’m going to take the spring off to focus on shorter stuff like the half marathon and the 10k – and any other race that sounds fun. 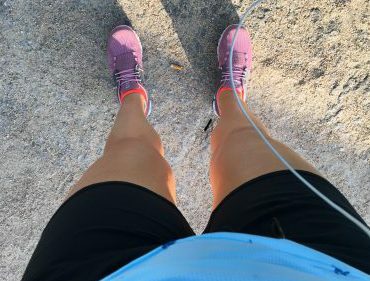 🙂 I also want to focus more on strength training so that I can really get ahead of the Achilles and hamstring issues that tend to plague me during marathon cycles. Next fall, I hope to be ready to take another crack at 26.2 miles. And I would be remiss not to give everyone who reads this blog and supports me a HUGE THANK YOU. If you donated to my fundraising efforts, I am so grateful. I ended up raising $1800, $300 more than my required minimum. If you cheered for me or tracked me, THANK YOU. All of the positive vibes and support I felt throughout this training cycle was incredible. 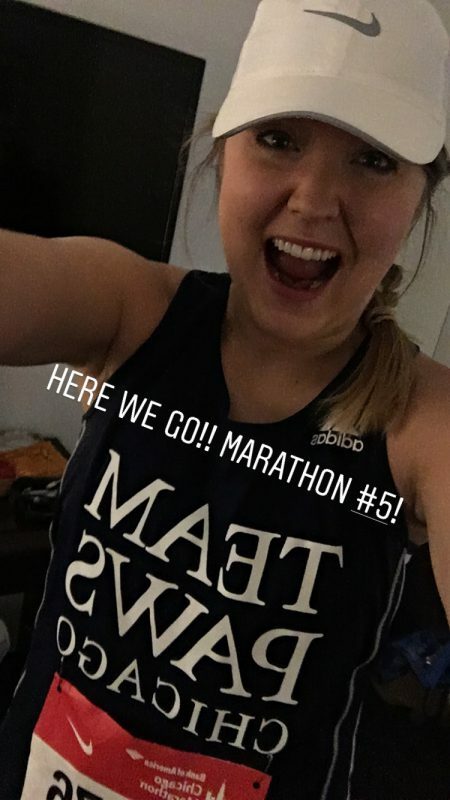 Marathon #5 is in the books! an achy Achilles (seems like this is likely to keep popping up if I don’t stick to my PT exercises). TWO hamstring scares – one on each leg. a cold that wiped me out during my peak weeks of training. But I’ve also run the most consistent and highest mileage ever during a marathon training cycle. Look at that consistency! That steady build of miles! According to my Garmin, in the past 4 weeks, I’ve averaged 48.2 miles/week. I’ve had one week over 50 miles already and I’m set to run one more big week this week before the real taper begins. Before Hyannis, I didn’t have time to accumulate this many weeks of steady training (Hyannis was in late Feb looking at the chart). So while I have felt more fatigued, I’m also really excited because I KNOW I’m stronger. In this cycle, I’ve run two 20-milers and two 18-milers. The first 18 went GREAT. I remember finishing and feeling like, “hey, I bet I could easily go another 2 and hit 20 miles no problem.” The middle 8 miles were supposed to be moderate, about MP + 15 seconds, getting faster towards the end. I hit those splits solidly. Two weeks later, I ran the first 20-miler, a doozy of a workout with a lot of MP miles and faster. I can honestly say, I went into it excited and ready to work. The first two sections of the workout went well, in that I was hitting my goal splits, BUT I could tell that I was working really hard to do so. I was supposed to run 7:30 and 7:15 pace for 2 miles and 1 mile respectively after that, and I came NOWHERE close, slowing down pretty dramatically. A day or two later, I came down with a pretty rough cold. In hindsight, I think maybe it was already beginning to affect me which was why I struggled so much on that run. The cold lasted longer than I expected and made everything feel really hard – even easy little 6 mile runs. THANKFULLY, I think I’m finally on the mend from that. All of this to say – that no, this training cycle hasn’t been perfect, but looking back, I do think it’s been really good. During my cold, I think I got a little depressed that everything was feeling so hard and I didn’t know what to think. Now, I can honestly say that I’m excited again. I’m ready to run the streets of Chicago and experience my first World Marathon Major! Haha, it’s definitely going to be different than all of the small-town marathons I’ve run before. Loved Hyannis, but not exactly many spectators out there! Hey there, hope you all had a good weekend! The week of 38 miles included a work trip to California for 5 days. I’m pretty happy I managed to get that much running in while on the road. 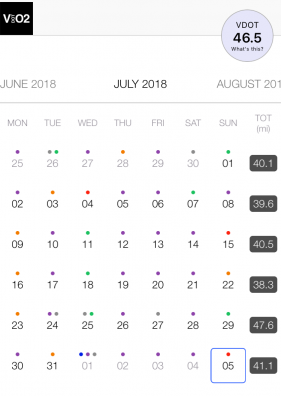 The plan is to keep me in the 40 miles/week range for a while and I’ll probably peak around 50-55 miles in early September. Another big plus – I MET MY FUNDRAISING GOAL! 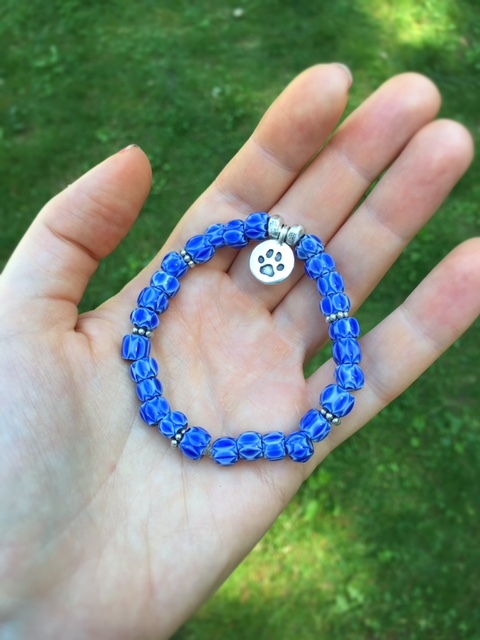 I was fairly confident I would be able to raise $1500 (the minimum I was required to hit for Team Paws), but I was still a little nervous and I didn’t want to cut it too close to the deadline in mid-September. I’m glad that this is one less thing I have to worry about now! One thing I AM slightly worried about has been the tightness that popped up in my right hamstring just over a week ago. The week that I was in California, I had been doing some goblet squats after my run and felt a weird twinge in my left hamstring. I immediately backed off and decided to do my long run that weekend at a nice easy pace with no speedwork just to play it safe. That went fine. A few days later, I was feeling 100% back to normal and did a relatively tough speedwork session. I didn’t have any pain throughout the session, but then running that evening with some friends, it felt tight and weird. Now, a few GOOD things about this since I am becoming a bit of an expert on hamstring pulls. Last year, I had done something similar where I tweaked my hammy doing strength work and then full-on pulled it later in the week during a tough speed session. In that instance, the pain was immediate and I knew I had done something terrible. Even running my easy, slow pace was pretty painful. This time around, there was no acute, ‘Oh sh*t’ moment. I think I was probably compensating for my left hamstring during the speedwork, even though I thought it was completely recovered. That, coupled with a boost in mileage after traveling, seems to have mildly irritated my right hamstring. Mind you – the right hamstring is the side I pulled badly last year, and is in general, my weak side. I discussed all of this with my coach and we’ve cut out speedwork for a couple weeks until it calms down. Thankfully, I don’t feel it AT ALL running easy, so I’ve been able to keep my mileage up and focus on my good ol’ hamstring rehab exercises. I’m slightly annoyed with myself BUT I also do feel from my previous experience that this is a truly minor bump in the road. My number 1 goal for Chicago is to get to the starting line healthy. Any time goals I have are second to that. I picked up a fresh pair of sneakers the other day! I went with the On Clouds again. I’m a big fan of this shoe. 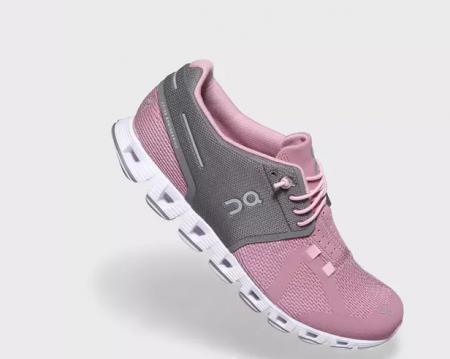 It’s a lightweight, neutral trainer with a 5 mm heel-toe drop. It’s a little funny looking, but the pods on the sole of the shoe give it just the right amount of cushion. I love it as a training shoe for the Nike Vaporfly 4%s. Those don’t hold up for a ton of mileage so I’m reserving my pair for very important races (like Chicago). I think that about sums up my training for the time-being! I’m excited to continue to build in August and get back to my speed sessions soon. 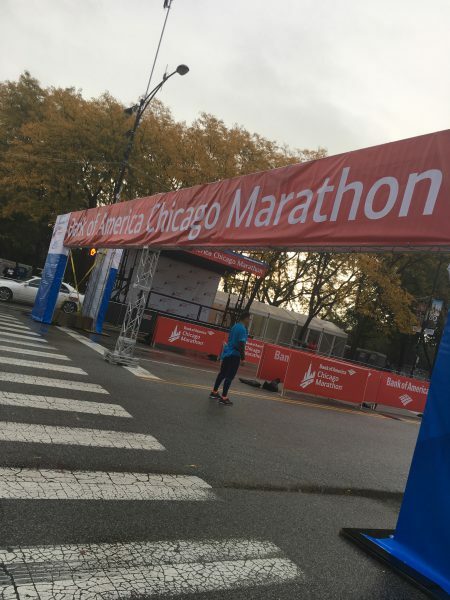 I wanted to pop in quickly to share an update on all things Chicago Marathon-related! 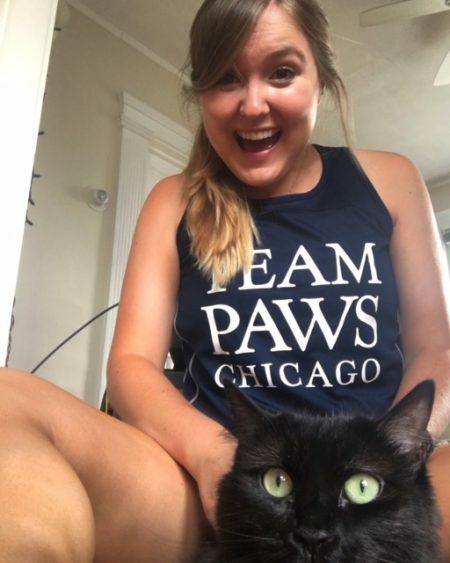 First off, I got my singlet so I can represent Team Paws in October and I am so excited. Fundraising is also going great! 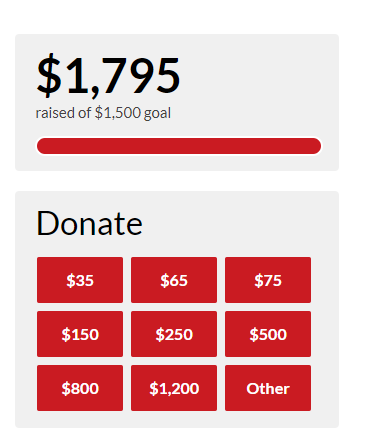 I am so SO close to reaching my fundraising goal! Less than $300 to go!! (If you would like to donate, you can visit my page here). Again, HUGE thank you to everyone who has donated! It really means a lot to have so much support. Now for the training stuff! For the past 3 weeks, my mileage has been hovering right around 40 miles a week. I’m still doing a lot of shorter, faster interval workouts, but I have started getting some marathon pace work in during my long runs, and boy are those workouts fun. My A-goal for Chicago (assuming everything goes well in training and I get a nice weather day) is a 7:45/mile pace. I don’t know if it’s just a confidence thing, but this pace has been feeling a lot more comfortable from the get-go than my 8:00 pace did when I first started training for Philly last summer. Last year, it took quite a while for that pace to feel comfortable and like it could be sustainable for 26.2 miles. Maybe I’m just learning to trust the process, but I feel in my heart that 7:45 is totally doable for me in Chicago. But time will tell! Speaking of marathon pace miles, yesterday I ran the Malden 10k. My coach had me use it as a workout to do a marathon progression, and I was SO happy to comply. The course had a really challenging uphill pretty much from mile 1.5-2.5 and it was a hot, sticky morning so it would have been a tough day to race hard. The elevation profile from the course. See?? I was not kidding about that hill! I did a 3 mile warm-up to tack on some extra miles for the day, and met up with my friend near the start. It was pretty crowded in the corral, but thankfully the pack of runners thinned out quickly. 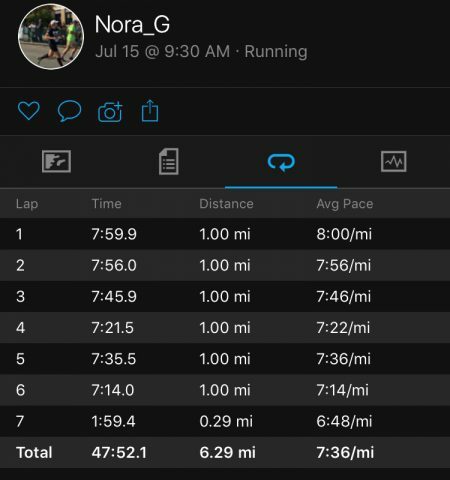 My coach had told me to start out around 8:00-8:10/mile and to cut down from there, just focusing on making each mile faster than the one before it. Not perfect, but pretty darn good! 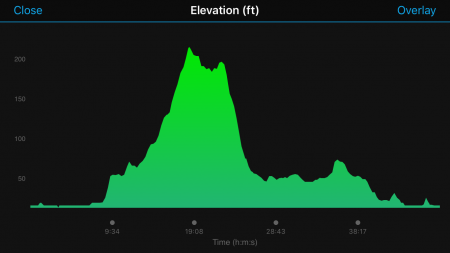 I had looked at the course elevation profile before, and I was a little worried about how the hill was going to affect me, but thankfully it was early enough on that I was able to handle it. And you know what they say – what goes up must come down! Mile 4 had a HUGE downhill section that felt amazing. That 7:22 pace threw off my perfect progression, but it truly felt effortless. Mile 5 was back to reality, but even then I felt really strong and in control running that 7:36 split. 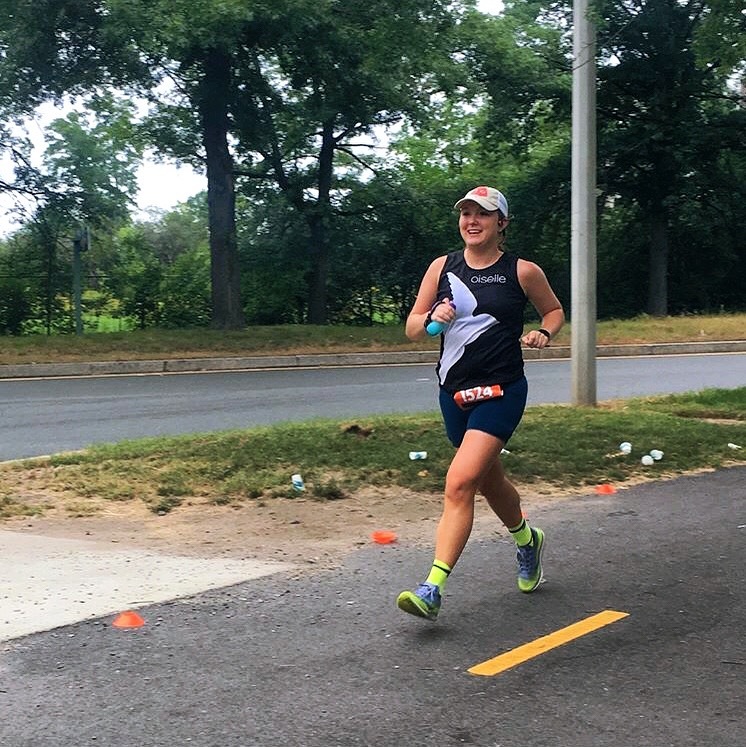 I think my friends were cheering for me here at the finish, which is why I’m smiling even though I’m desperately trying to kick. Overall, I’m really pleased with how this went. 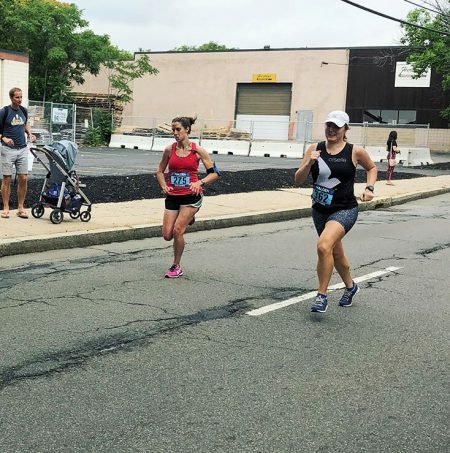 I ran within myself and finished feeling strong and like I could have gone further – and that’s with the hills and humidity! This has me so excited for what’s to come. I’m toying with the idea of doing a half in early August and I think I’m leaning towards doing it. It’s time to knock a few minutes off the half PR! So I haven’t even run the Hyannis Marathon yet and I’m already signed up for another 26.2. Oops! I entered the lottery for the Chicago Marathon back in November and on December 12th, I found out I didn’t get in. Initially, I was really disappointed. For some reason, I’ve felt a pull to run Chicago more than any of the other Marathon Majors. Maybe it’s all because before my first marathon, I watched the movie Spirit of the Marathon which chronicled the stories of 6 marathoners preparing for Chicago. Needless to say, I was inspired. After watching, I vowed to myself that I would someday run Chicago. After talking it through with a couple of my running friends (who also didn’t get in), I decided to look into running it for a charity. 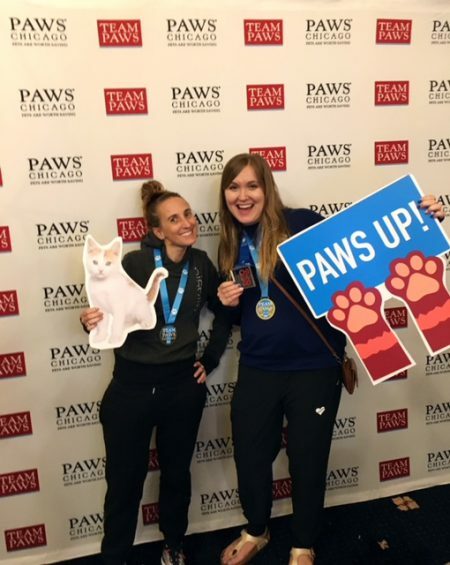 I had heard about Team PAWS before from listening to the Bibrave Podcast and thought it sounded awesome. 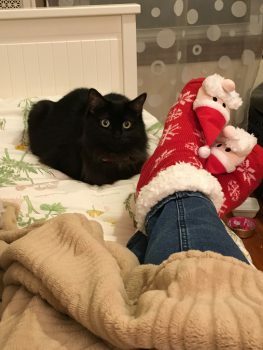 After adopting Callie this summer, it felt even more perfect. The amount of joy, love, and laughs she has brought into my life since July is immeasurable. 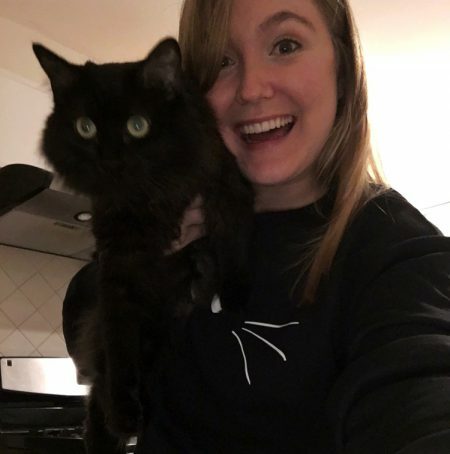 Being able to support an animal shelter that helps connect animals with loving homes in the Chicago area felt like the natural choice. I’ve never run a marathon for a charity before but I’m excited about the opportunity to raise money for a great cause while doing something I love. My fundraising minimum is $1500 but I’m hopeful I can raise a little more than that.